When most people think about RVing, they imagine an adventure-filled life on the road, traveling from one exotic locale to the other. While that can certainly be the majority of your time in your RV, one element often gets overlooked, particularly by new RV enthusiasts: dumping. For those who are used to flushing a toilet and never having to worry about their waste, dumping from an RV can seem like a daunting and overwhelming experience. Fortunately, it doesn’t have to be as bad as you imagine, especially if you install an RV macerator pump. Today we’re going to be looking at the best RV macerator pumps, as well as discuss why they are valuable to have, as well as what to look for when comparing different models. Dumping your black water can be a much easier and smoother experience when you have the right macerator pump installed. When looking at different macerator pumps, you’ll notice that you can choose models that are either installed permanently to your RV or ones that are portable. This unit is one of the latter, meaning that you only have to use it when necessary. Let’s see how it can make dumping your tanks easier and more enjoyable. Depending on how you RV, you may never have to worry about using a macerator pump. However, there may be some circumstances where you can’t access a regular dumping station, or you merely want options, just in case. For those times, having a portable macerator pump is ideal. Because you only have to attach it when you need it, you don’t have to worry about paying a lot, nor do you have to worry about the installation process. Overall, I highly recommend portable macerator pumps if you’re not sure when you’ll need one. They are excellent for those who like to be prepared for any situation. With some macerator pumps, you have to get up close and personal to turn it on and off. As you can imagine, the smell from your black water tank is probably going to make that seem a lot less enticing. Fortunately, this particular pump has a remote button so that you can run the machine from a relatively safe distance. While smells can still permeate the air, they won’t be as overpowering when you’re able to stand further away. As with any kind of pump, you never want to run it without some liquid going through it. If that does happen (i.e., the tank empties before you realize), then the pump will automatically shut off. Not only does this feature help protect your investment, but it ensures that you shouldn’t have to pull the pump apart to fix it (no one wants to do that). Although portable macerator pumps are not as powerful as permanent models, this one can do the job quickly and efficiently. I like that it comes with a remote control and that it has protections in case the tank is dry. Overall, if you don’t have to use it regularly, this pump can really help out. As with any portable macerator pump, this unit is not designed for continuous use. I highly recommend using these kinds of devices only when dumping at a station is not suitable, and even then, don’t do it with a full tank. The reason this pump (and other portable ones) don’t work well for continuous use is that they aren’t built for it. With only 12 volts of power, it can’t handle an oversized load, so don’t attempt to put it through that. Our last permanently mounted macerator pump is much more efficient and powerful than most of the other models we’ve already seen. Let’s see how it compares and whether it will make a decent addition to your RV. A significant reason why this pump works better than others is that it comes with two blades instead of one. Rather than relying on a single stainless-steel impeller, this pump does double the work, allowing you to process waste that much faster. As with most modern macerator pumps, you can run this one dry without destroying the motor. This feature also means that it’s self-priming since you don’t have to let waste fill the pump before turning it on. In some cases, you need to hire a professional to install a macerator pump. Although I always recommend it to confirm that you don’t experience any issues (i.e., leaks), this is one of the easier models to install yourself, if you feel so inclined. Compared to other models, this pump is faster and more efficient. With a max flow rate of 13 gallons per minute, you can empty your black and gray water tanks more easily. I also appreciate having two blades instead of one. Although this machine can process waste faster than most others, it isn’t built to last. Other permanent pumps can remain on your RV season after season. However, in this case, you will likely have to replace it annually to make sure that the quality is the same. Although I like the convenience and practicality of a portable macerator pump, I can also understand why you may prefer to install one permanently on your RV. in this case, we have a marine pump, which is designed to process fish parts, meaning that it should suffice for your waste without any problems. For the most part, using a macerator pump often is only useful if you don’t want to visit any RV dumping sites. While some of these places can be quite off-putting, it’s usually better to use them than most alternatives. However, that being said, sometimes it’s nicer to be able to chop up your waste and feed it through a garden hose, particularly if you have to park further away from the sewer connection than usual. Regardless of your reasoning, having a macerator pump permanently installed on your rig can be a good idea, especially if you plan on using it often. As with all of these pumps, you want to make sure that you get a model that will last a long time. Since this particular motor is both insulated and runs off of magnets, you can be sure that it won’t have any trouble processing your black water waste for seasons to come. With some pumps, you can’t run it without liquid inside of it already, meaning that you have to let wastewater flow into the machine before turning it on. Fortunately, that’s not the case here, meaning that you can simply open the tanks, turn the pump on, and let it operate. Overall, this is a simple and efficient macerator pump. If you’re looking for something quick and easy, then this is a good buy. I also like that it primes itself and that it’s more compact than other pumps. One of the most significant issues is that some of the studs on the pump are not made of stainless steel. Although rusting is a much bigger problem if you use it for marine purposes, these studs can corrode relatively quickly. When that happens, you’ll need to replace the pump, lest it starts leaking black water while running. Next, we have another permanent installation pump. This model is built to process waste almost as quickly and efficiently as a toilet in your home, so you can be sure that you’ll get as much use out of it as you like. Let’s see how it compares to the rest. One element to pay close attention to when looking at different macerator pumps is how quickly they can operate. If the flow rate is relatively low, then it can take longer to dump your black water tank than if you used a regular dumping site. With a rate of 12 gallons per minute, you can be sure that you’ll be able to remove all of your waste quickly and efficiently. However, pay attention to the pressure levels, as more pressure will cause the pump to work slower. Although this pump can be installed permanently on your RV, having a quick-release connector also means that you can use it as a portable model as well. Thus, if you’re not sure how often you’ll be using your pump, this is an excellent choice until you decide whether to mount it or not. This is a fast and efficient pump that will make short work of any black water you have accumulated in your RV. Although it’s not as powerful or as heavy-duty as other pumps on this list, it’s more than sufficient for most mobile homes. Since this isn’t a complete system, you will have to buy wires and switches for it to work properly. Considering that most other pumps come with these components, it seems like it’s more hassle than the pump is worth. Our final macerator pump is another portable model. As I mentioned before, mobile units are typically better options because you never know how often you’ll need to use it. I highly recommend buying a portable pump first to see if and when you use it, and then make a decision about whether to upgrade to a permanent model. Let’s see how this one stacks up. Although most portable units are convenient, this one takes things a step further by allowing you to twist the pump onto your RV in one quick motion. Rather than having to fumble with different components, you can be ready to go in seconds. On the flip side, pulling the pump off is just as easy, meaning that this is probably one of the more convenient models you can find. One issue with most macerator pumps is that they don’t come with a hose. Yes, you can use a standard garden hose with most of these machines, but that doesn’t mean you should have to buy one just for this particular purpose. Thankfully, this model has its own rugged and flexible hose. That being said, it’s only ten feet long, so you may have to switch to a garden hose anyway, depending on your situation. Part of the reason some people use a macerator pump is that you don’t have to rely on gravity to do the work. Although dumping stations are designed to let your waste flow down into the sewer, you may not always have that option. Fortunately, this pump has a strong enough motor to where you can pump uphill if necessary, meaning that you never have to worry about dumping your waste water ever again. When it comes to convenience, reliability, and speed, this portable macerator pump has it all. I like that you can install it immediately, as well as the high-powered motor inside. If you’re looking for a high-quality portable pump, this is certainly a good bet. The cost of this pump is much higher than the others, including those that install permanently. Just because it comes with a hose doesn’t justify the higher price tag. Also, in some rare cases, the fuse inside may blow, meaning that you might have to repair it sooner rather than later. Technically speaking, there are three different kinds of macerator pumps. However, for the most part, people will only choose between two of them - permanent vs. portable. The third type of pump is one that uses a 110-volt motor, meaning that it is much more powerful and reliable than the other two. However, because it uses so much power, you need to be plugged into an outlet before you can even think about using it (unless you’re fine draining your RV batteries). Overall, portable is going to be better, assuming that you don’t know if or when you’ll be needing a macerator pump. I always recommend going to a dumping site, but if that’s not an option, then having a portable unit handy can be a lifesaver. When looking at the different pumps, you’ll want to see whether the price is worth it. For example, if you only use your pump once or twice a season (if that), a cheaper model may be the best choice because you don’t need it that often. On the other hand, though, cheaper can mean lower quality, and you will likely have to replace your pump more often. So, if you like the idea of only buying a macerator pump once and using it for years, then paying more for it can be justified. I would recommend buying a cheap model at first and seeing how often you use it. If it’s a regular occurrence, then consider upgrading to something a bit more robust. If you never touch it during your travels, then at least you didn’t spend a fortune on it. Unfortunately, the vast majority of macerator pumps are only the pumping mechanism and nothing else. This means that you have to buy connectors to go from the pump to the RV, as well as to the dumping site (i.e., the sewer or the toilet). Thus, there are at least two different pieces you’ll have to buy in addition to the pump. The first is a hose. Fortunately, most of these models work with a standard garden hose, so you can find that easily at any department store. With that in mind, never use the same hose you have for other things on your RV. Once it’s been used for black water draining, that’s all it should ever be touching from then on. The second piece you’ll need is a clear elbow. This connector allows you to hook up the pump to the tank itself. It has to be clear so that you can see when waste stops flowing through. Yes, it may seem a bit unseemly, but since you can’t run the pump dry, it’s a necessary part of the dumping process. When choosing this elbow, however, make sure that it’s compatible with both your RV and the pump you have. Since RVs don’t have standard connections, not all elbows are interchangeable, so keep that in mind. Technically speaking, you never “need” a macerator pump for your RV. As long as you use a dumping station, you can simply use the three-inch flex hose that comes with your rig. That being said, if you like to boondock in various places, or you like the idea of dumping at home rather than a site elsewhere, using this kind of pump may be preferable. Overall, the only time you’ll need this kind of pump is if you can’t reach a dumping site with the standard hose, or if you have to connect to a regular septic system (i.e., a toilet). Ideally, you won’t find yourself in that position, but if it ever arises, having this kind of pump will save you a lot of hassle. As I mentioned, most of these pumps don’t come with a hose. Part of the reason is that there is no standard for these pumps, meaning that you may or may not be able to connect it to your RV in the first place. The other reason why manufacturers don’t include a hose is that you usually never know how much you need. In some cases, 10 feet is enough, while in others, you may have to run a hose from your RV in the driveway to a toilet in your home. Overall, however, these pumps can connect to a regular garden hose, so finding one shouldn’t be an issue. That being said, check the connector first so that you’re sure it will work. Overall, when talking about macerator pumps, portable is always going to be better. Unless you’re planning on using this kind of pump all the time (unlikely), a portable version will be so much more convenient. 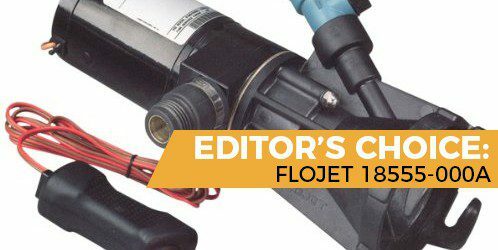 So, with that in mind, I highly recommend the Flojet 18555-000A model. I like that it’s easy to install, as well as the fact that it comes with a remote control. Overall, if you’re looking for speed and convenience, Flojet has you covered.